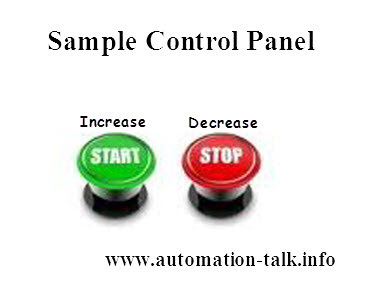 In some of the application in industries, need of increasing and decreasing the speed using VFD drive through a single control panel using the push of Buttons is required. One of the best example of such machine is sheet laminating machine where operator can simply increase/decrease the speed using buttons. In Omron JX drive this function can be performed with ease through parameter of the drive. Here we are not talking of MODBUS communication and will use input from terminal. This feature can also be done using MODBUS communication and also with the help of POT. Subscribe to Automation-Talk by Email. Below are the important parameters which need to be set in Omron JX drive to use increasing and decreasing Speed feature using Buttons. In this parameter select 02 to use Digital operator as the input source for frequency. By default this is set to 00 (Digital Operator- Freq. Adjuster). By default this is set to 02 for digital operator. Select 01 for terminal mode. By selecting this parameter, you will only able to give run command through control panel or terminal buttons. This is the parameter which lets you use first input button, say Start button as increase button. By default this parameter value is set to 00 for Forward (FW). Change this value to 27 which will increase the frequency. By default this parameter is set to 01 for reverse (REV) and we have to select 28 which will decrease the frequency. This feature is applicable while the machine is in RUN mode. 1. While the UP/DWN terminal is turned on, the acceleration/deceleration time depends on F002, F003/F202, and F203. 2. You can store a frequency set value after UP/DWN adjustment. Choose whether to store the value with C101. 3. Also, you can clear the stored frequency set value by allocating 29 (UDC) to the desired multifunction input and turning on/off the UDC terminal. 4. The UP/DOWN function is disabled when the JG operation is enabled. 5. The UP/DOWN function is enabled when the frequency reference selection (A001) is set to the Digital Operator (02). 6. The UP/DOWN function is enabled when the multi-step speed reference is enabled. After setting the above parameter you can test this by using Start and Stop buttons. Use start button for increase and stop button for decrease. Now press and hold the increase button to increase the speed and release the button to hold the speed to that point and do same for decreasing the speed. If you have any issue in setting your button to UP and down mode (increase/decrease) then please let us know. To get the latest tutorial and program subscribe to Automation-Talk by Email.